It’s a closeup of the steampunk city of Veldrif for your viewing pleasure. Just for the record, we didn’t die! We’ve put the comic on “pause” for a little while so we can finish up our Kickstarter obligations as well as work on some stuff we can’t really talk about right now. We’re hoping to be back to regular updates soon! 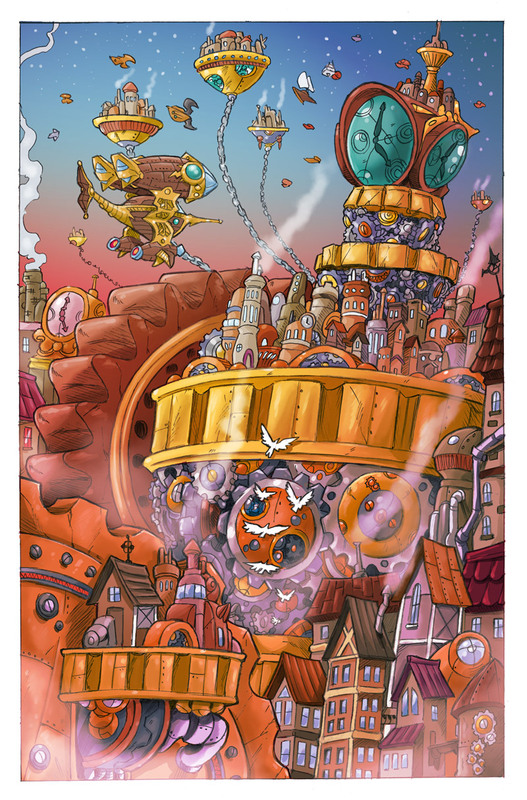 Tags: airships, comics, steampunk, steampunk city, steampunk webcomic, Veldrif, webcomics, Wibbly Wobbly Timey Wimey! aahhh, i really look forward to your comic releases, I can’t wait until the next page comes out~! If I lived there, I’d get ticked off at all the noise from the clockwork. It would be great if someone like Nickelodeon or Cartoon Network picked up your web comic and turned it into a show. Well we are working on something. Just can’t talk about it yet. Sorry guys, we have not forgotten you. Honestly, we haven’t. Thom just started a new day job (2 hours away) and he is working crazy hours, the new Scrooge book for Fantagraphics, and trying to catch up the Kickstarter, and then this other thing we are working on (It is Shadowbinders related) We want to get back on track so bad and we feel really bad about it. In an ideal world we could just do this all day (someday soon we may be able too) We will be back! Oh and I agree. It would be AMAZING if someone picked it up as a show. I think or Crimson Rhen or Shadowbinders would make great shows/or movies…but I am biased. Yep. What Kam said. Stuff happening with Shadowbinders — but we can’t talk about it yet. And we’ll definitely be back! This is gorgeous!!!!! I started and caught up with Shadowbinders today and love it so far! Where can I buy the graphic novel? Thanks! I`m so excited! I`ll probably wait so I can buy both volumes together. Will Vol. 1 be available to buy once Vol. 2 is released, or is book one the same as Vol. 1 just in a different cover? It will be the same book with new cover. They both will be available. 30 points to Gryffindor for the DW reference! Oh wait, perhaps Ravenclaw? Since you’re writing a story and all. But it could be the others. . .
Well confound it all! Which House(s) do the two of you belong to so we can award these points!? Do you think we might have an early Christmas present with an update on Shadowbinders by Thanksgiving? Oh, there’s definitely more Shadowbinders coming. In fact, we’re in the process of recruiting a colorist to help pick up some of the slack. With the Kickstarter fulfilment and the long commute to the new day job, it’s been very hard to keep the webcomic on schedule these past few months. Thanks for your patience! Is this a new font? I LOVE IT!!!! Before I ask my question, I just want to say that I absolutely LOVE this comic!! It’s just amazing! So, obviously, I check back here every day with that little bit of hope that you guys have started it up again. I don’t mean to sound rude; I know that certain comments can seem ambiguous over the Internet. I’m honestly just wondering if you have an estimated time for when you’ll begin to continue your comics. Every day, I check back to see if I can see what happens with Rhen and Mia and yes, even Marek. It would just be a whole lot easier to have an approximate time period to look forward to. P.S. I would also like to thank you for being awesome and having this comic up for free! Once again, it’s simply amazing! Hello! Thanks for writing and for your support! Believe me, we’re just as anxious to get back in the swing of things as many of our readers are. Unfortunately my new day job (with a 2+ hour commute!) has left me with far less time for comic making these days, and what time we do have has been going toward getting caught up on Kickstarter rewards. HOWEVER, I have started drawing new pages this week and we’re looking to bring on a colorist to help speed up production. Hopefully we can start posting new comics again by year’s end! We are working on it. I promise. To the creators: do you have any idea when you will make our day and come back? We’re getting ready to start up again! Hopefully by the end of the year?